Uttarakhand has vast water resources and is a lifeline for millions of people living in downstream areas. However, many areas in the state are facing a water shortage. The hill state is going to polls in the first phase of the 2019 Lok Sabha elections on April 11. In some constituencies, voters, dissatisfied with authorities for failing to provide water facilities, aim to register their protests, by boycotting the elections. A 2018 NITI Aayog report had held that approximately 50 percent of the mountain springs in the Indian Himalayan region, which includes Uttarakhand, are drying up. It is significant because most of the drinking water supply in the mountainous parts of Uttarakhand is spring-based. Land of snow clad peaks and glaciers, which are origin to many rivers, Uttarakhand, the reservoir for the northern India’s plains, quenches the thirst of hundreds of millions of Indians. But its residents remain parched as several parts of the hill state routinely face water shortage. The issue has assumed significant ground in the run up to the 2019 Indian elections as well. Elections to the 543 seats of Lok Sabha (lower house of Indian parliament) will take place over April and May 2019. Of the 543 seats, Uttarakhand accounts for five seats, Almora, Garhwal, Hardwar, Nainital-Udhamsingh Nagar and Tehri Garhwal, which are going to polls on April 11. 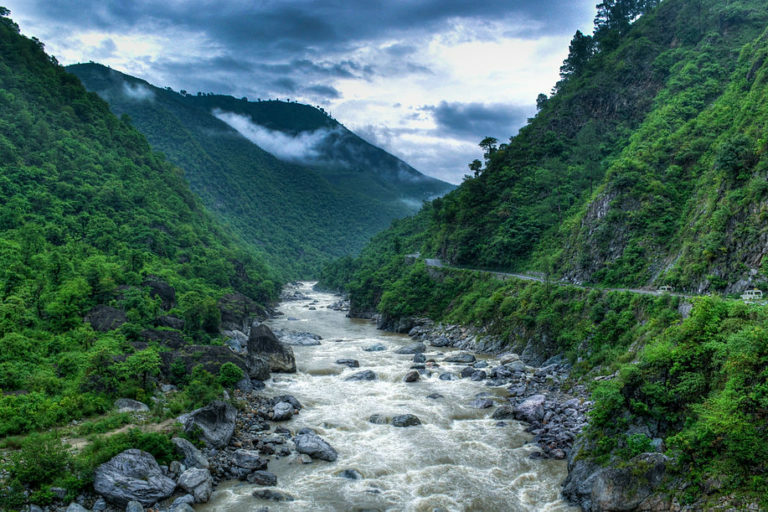 Carved out as a separate state from Uttar Pradesh in the year 2000, Uttarakhand has seen a significant push for hydropower projects on the River Ganga and its tributaries which flow through the state. And while these projects progress on the state’s rivers, the authorities have failed to provide safe drinking facilities for the local residents. As per a 2018 report of the Comptroller and Auditor General (CAG), Uttarakhand is among the states where less than 50 percent of the population had access to adequate quantity of safe drinking water. Besides the lack of water facilities, the state is also a witness to overexploitation of groundwater, land use change, deforestation and drying up of water resources like springs and ponds. Kishore Upadhyaya, a senior leader of the Indian National Congress party from Uttarakhand and former head of the Uttarakhand Congress, lamented that the state provides water to hundreds of millions of people downstream but its issues are not heard by anyone. “Uttarakhand is like a water factory. We have big projects like Tehri dam through which water is being provided to states like Rajasthan and Delhi. But people living in the area near Tehri are being forced to pay hefty water bills. The issue of water and clean air are not the top issues being discussed in the elections. We are trying to change that,” Upadhyaya told Mongabay-India. “There needs to be a sustainable policy for Himalayas,” he added. Echoing similar views, Vimal Bhai of Matu Jan Sangathan, an Uttarakhand based non-governmental organisation, said it is ironic that people of Uttarakhand are facing a drinking water problem even as rivers flowing near their villages are quenching the thirst of millions in the downstream areas. “The worst part is that mainstream political parties have largely ignored these issues. It is only smaller parties that are talking about these issues,” he said. Is water a priority for the voters? The problem of water shortage is not new to Uttarakhand. In early 2018, a report by the United Nations Development Programme (UNDP) had found that the state is facing acute water crisis. In December 2018, people from around 40 villages in Pauri Garhwal region had threatened to boycott the 2019 elections if the water crisis was not resolved. Some residents of Mussorie, a popular tourist town, too had voiced similar sentiments of boycotting polls of their repeated complaints regarding inadequate water supply are not solved. The drying up of mountain springs, considered lifelines for people in the hills, has only worsened the problem of water shortage. A 2018 report by Indian government’s think tank, NITI Aayog, acknowledged that most of the drinking water supply in the mountainous parts of Uttarakhand is spring-based. It had revealed that approximately 50 percent of the mountain springs in the Indian Himalayan region, which includes Uttarakhand, are drying up. “They are part of electoral discussion only in some small pockets. For instance, solid waste management is an important issue in urban areas of Uttarakhand while in some rural areas people are protesting against the lack of drinking water facilities. Sand mining too is an issue but it is limited to a small area. Drinking water is an issue because Himalayan springs, which are the main source of water, are drying up. However, successive governments have failed to take cognizance and act on it,” Chopra told Mongabay-India. Uttarakhand has vast water resources but yet, its citizens are facing a water shortage. Photo by Rajarshi Mitra/Flickr. Ajay Bhatt, who is the president of the Bharatiya Janata Party and its candidate from the Nainital-Udhamsingh Nagar seat, admitted that water shortage is an important issue for the people in the state. “Drinking water is a main issue and is on my agenda. It is a big problem in this area due to groundwater levels going down. It is a problem that the whole world is facing. Moreover, it has also been noticed that snowfall is also decreasing, which is an issue of grave concern,” said Bhatt. However, as per a recent survey released by the Association for Democratic Reforms (ADR) , which listed top three voters’ priorities in every constituency, environmental issues did not figure as a top voter priority in any of the five seats in Uttarakhand. The one priority issue that was common for all the five seats was ‘better employment opportunities’ while other issues high on people’s minds were traffic congestion, agriculture-governance related issues and better health facilities. Since Uttarakhand’s formation, there has been a significant thrust on developing hydropower projects in the state but they have always been controversial due to intense pressure from environmentalists who demand free flowing rivers including Ganga. According to the official data, there are at least 124 hydropower projects, either in operation or under development, of total installed capacity of over 13,000 megawatt in Uttarakhand. The 2013 Uttarakhand floods that resulted in deaths of thousands of people also led to protests against dams as reports held that they aggravated the impact of the floods and increased the damage. However, the issue seems to have lost steam for now and is not even part of the election agenda. Uttarakhand based environmentalist Ravi Chopra said what speaks volumes about the apathy of governments is that no authority or politician has cared to take note of Swami Atmabodhanand of Matri Sadan in Haridwar, who is sitting on fast for over 160 days demanding steps for a clean and free flowing River Ganga. BJP’s president in Uttarakhand, Ajay Bhatt said dams are important as they help in improving the water levels. “If we had no dams, we would not have been to ensure water at Allahabad (now known as Prayagraj, in Uttar Pradesh) during the recently held Ardh Kumbh celebrations,” he added. Banner Image: Several villages in Uttarakhand have threatened to boycott elections to protest against lack of water facilities. Photo by TanayaPrapti/Wikimedia Commons.